Indra Vijay Singh turns 65 this year. And when this jeep restorer puts his mind in reverse gear, he opens a trunk full of cherished memories. “My love for jeeps goes back to when I was a little boy. My father was commanding officer of a regiment. So when the CO’s jeep would pull up to pick him up every morning, I used to plead with the driver to let me play with the steering wheel and he would indulge me. By the time I was 10 years old, I was driving,” he chuckles. Singh went on to get a degree in hotel management but his preoccupation with jeeps only grew with time. He has rising fuel prices in the 1970s to thank for getting him started on restoration. “When petrol prices skyrocketed, jeep owners began discarding their vintage petrol jeeps in favour of diesel-powered roadsters. 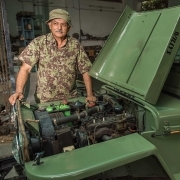 That’s when I decided to buy old jeeps and restore them,” says the Jaipur-based Singh, who soon traded in his job as manager with the ITC Group for gloves and a monkey wrench. Two years later, he discovered that restoration was also about the thrill of the ride. “In 1987, I restored my first Scripted Ford jeep, which was in bits and pieces. The body was lying in Sanganer, while I acquired its other parts from different places in Jaipur and put them together. The jeep now belongs to Siddharth Kasliwal of Gem Palace, one of Jaipur’s oldest jewellery stores,” says Singh, who himself owns nine classic, vintage jeeps. 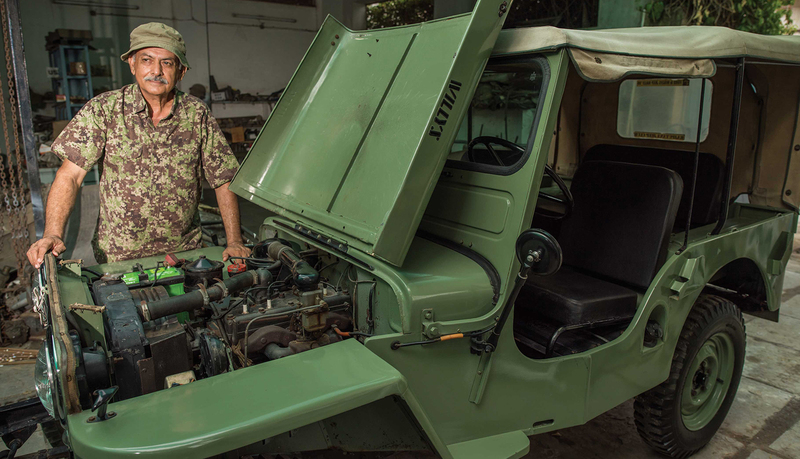 We get a brief history lesson as Singh says one of the rarest jeeps he has encountered is a Willys M38 A-1, American Army issue, which the Indian Army captured and brought back from Pakistan during the war of 1965. “I picked it up in 1978. I saw it parked near Shalimar theatre in Jaipur. I instantly knew what it was because my father was commanding a regiment during the 1965 conflict, and I knew that four captured jeeps had come back with them. A watch dealer and a mechanic had bought it in partnership. I negotiated with them, and that’s the jeep I’ve had the longest,” he says. Vintage jeeps cost a bomb. However, Singh’s clients belong to Rajasthan’s crème de la crème. The state also has many collectors of vintage cars as well as exclusive clubs of these connoisseurs. Singh, who is the founder of Jaipur-based Rajputana Jeep Club, says restoration can take between six months to four years, depending on how challenging the project is. About 18 years ago, he picked up a Ford GPW 1943 jeep from Banswara in Rajasthan. It had belonged to one of the many members of the Banswara royal family. They had dismantled the jeep in an attempt to restore it. But the automobile ended up in bits and pieces in a cowshed for 30 years. “The pieces were even submerged in water during floods once. We had to get them out in a tractor-trolley as I couldn’t get a truck there. It took me four years to rebuild the jeep as it had several parts missing,” says Singh, satisfied that the beauty is a prize-winner today. He says his job is even more painstaking as he does his best to approximate the original vehicle—customising, for him, is out of the question.